The Supreme Court has vindicated our judicial review of the Scottish Government’s controversial Named Person scheme, ruling the plans unlawful. 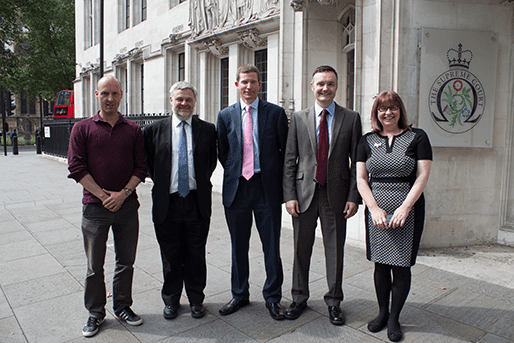 In a historic decision the five judges, including two from Scotland, unanimously struck down the central provisions of the scheme this morning. The Scottish Government has no opportunity to appeal. The landmark judgment in the case of The Christian Institute and others v The Lord Advocate (Scotland) was written by senior Scottish judges Lord Reed and Lord Hodge, along with Deputy President of the Supreme Court Lady Hale. The whole judgment was then agreed by two other Supreme Court judges. Under the proposals, from 31 August every child in Scotland was to be assigned a state guardian to monitor their ‘wellbeing’ – defined as “happiness”. However, the Court stated that the data sharing provisions of the Children and Young People (Scotland) Act breach the right to a private and family life under article 8 of the European Convention on Human Rights (ECHR). These provisions, central to the scheme, have been struck down. The Christian Institute co-ordinated the successful legal action. Institute Director, Colin Hart, said the ruling was a “vindication” of what the Institute and others had been saying for years. Mr Hart said: “This is a devastating blow for the Scottish Government which sought to brush off all criticism of its Named Person scheme as ‘scaremongering'”. The Court stated that “within limits, families must be left to bring up their children in their own way”. “The ruling protects families all across the UK from unwarranted invasion of their privacy by the state. Dubbed the “State Snooper” scheme by the Scottish press, the Named Person law has endured months of hostility from the public, and hard questions for the First Minister Nicola Sturgeon and her Deputy, John Swinney. Unions representing the health visitors and teachers due to be assigned the Named Person role criticised the plans. A poll on behalf of The Christian Institute in March this year found nearly two-thirds of Scots believed it was an “unacceptable intrusion” into family life.